There was such a dramatic shift in tone in the new episode of True Detective that at times it felt like a completely different show. Whereas the initial three episodes were deliberate, more interested in evoking mood and exploring character than anything, “Who Goes There” favours quick thrills and technical wizardry. There’s much to admire in the fourth episode of True Detective, but there’s a degree of thoughtlessness that seems incongruous to everything we’ve previously seen. Has True Detective finally overplayed its cards? The incredibly staged gun battle during the final six or so minutes of the episode was tense, but may ultimately be the first indicator that True Detective isn’t the show we all thought it might be. Was there any point to the gunfight other than immediate gratification? As Rust and Cohle drove away with Ginger in the final moments of the episode there was the distinct impression that there was little substance to all the exhibition. For a show that previously kept excess to a minimum there appeared to be no real purpose to the robbery other than the excitement of seeing Cohle and a bunch of bikers shoot up a neighbourhood. Plot need not be paramount, but neither should it be sidelined for insubstantial spectacle. The boys are on the hunt for Reggie Ledoux, whom it is becoming increasingly apparent was responsible for the death of Dora Lang. Or at least one of the figures responsible, since the likeliness of the involvement of second or third parties is also mounting. During an early scene with Lang’s ex-husband Charlie, Rust and Cohle learn of Ledoux’s connections to a satanic cult where Ledoux would go to ‘devil worship.’ It’s difficult to imagine, given the emphasis on religion in the previous three episodes, that there won’t be some connection between the murders, Billy Lee Tuddle and the mobile revivalist church. Or perhaps we’re overestimating Nic Pizzolatto’s plotting abilities? The worlds of both detectives are beginning to unravel. Hart’s infidelities and his insensitive nature finally caught up to him to family-demolishing consequences. It’s difficult to determine at present whether Hart’s separation will play a crucial role in his own attitudes toward the hunt for the killer or whether his marital problem are included just to give Woody Harrelson more to do. Interestingly enough, despite the troubles with his wife, Hart’s mind still seems very much on the task at hand. Cohle also made an unexpected return to the world of drugs, even before being forced to do them by an old biker acquaintance. It’s not clear why Cohle has begun drinking and substance abusing as of yet, but hopefully it wont remain one of True Detective‘s unrevealed mysteries. His handy connections to the biker gang the Iron Crusaders stretched to the incredulous, as did their relative ease at welcoming him back into their operations (to a degree). It’s the least plausible turn that True Detective has made to date, and it makes it at such a breakneck pace that Pizzolatto doesn’t even bother to give the development credence. “Who Goes There” is the beginning of a possible end for Cohle and Hart. 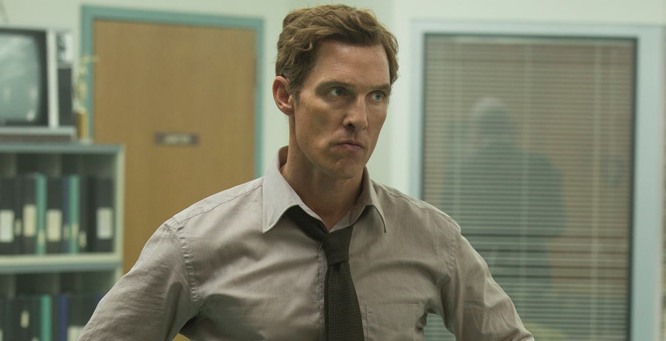 Prior to Cohle going ‘off the books’, neither had any compelling reason to lie to Det. Maynard Gilbough and Det. Thomas Papania. But the present day detectives aren’t buying Cohle’s story about his father’s leukaemia, and Cohle and Hart’s hastiness in infiltrating the Iron Crusaders may have some devastating consequences.